» City Planners Ride to Watts Ride South L.A.
Below are a few reflections from Otto Khera of the RideSouthLA team, who joined the ride. 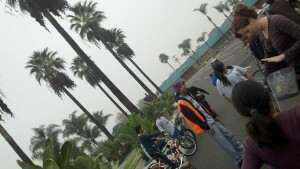 For an extended discussion, see coverage of the ride from Sahra Sulaiman. 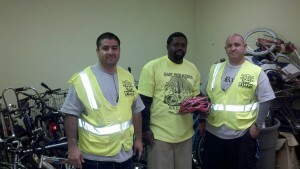 The ride was part of the Neighborhood Bike Ambassadors Program – South LA organized by the Los Angeles County Bicycle Coalition. 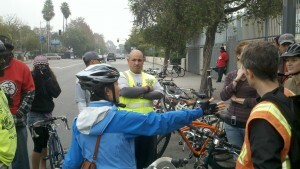 On Saturday, December 8, 2012 a committed team of Los Angeles City planners led by David Somers together with cyclist mover and shaker and Streets Blog LA South LA beat columnist Sahra Sulaiman set off on bicycles to Watts from downtown LA in the early morning. The goal: To understand and document the most pressing cycling and walking infrastructure needs in the Watts area based on the local feedback from expert cyclists from the area. The team of circa 10 cyclists streamed south on Main Street that turned into a new bike lane at 92nd Street, cutting across 98th Street and connecting to Central Avenue’s recently created bike lane via a short zig zag that included Clovis Ave and Century Blvd. At 109th and Central, the group reassembled at the Watts Labor Community Action Center (WLCAC) together with the two local cycling clubs East Side Riders (ESR) and Los Ryderz who often use the space for bicycle education and as a point of departure for rides, and each with a committed number of young and older riders who know the area well. After some general discussion amongst the riders and about the purpose of the ride, the larger group numbering over 20 riders set off across 103rd to Wilmington, down to Watts Towers, and back to the WLCAC. Along this route and on the ride to WLCAC, city planners made careful note of the major potholes in the area that could cause problems for cyclists. The entire group learned from those experienced with riding and walking in the area about troubled crossings and where either a lane or a ‘sharrow’ (a marking to indicate that a lane should be shared by bicycles and cars) would benefit cyclists who needed to connect to across the area safely. One so-called ‘low hanging fruit’ was a possible sharrows that could connect Watts Towers and the nearby MTA Light Rail Blue Station to Wilmington and 112th via Willowbrook that runs between Watts Towers and the Blue Line. In the area Wilmington and 112th/114th the group learned from a local rider named Stalin that the night life and connection to the 105 freeway was creating serious safety problems that might be remedied by some forms of ‘traffic calming’ (ways to slow car traffic) whereby speed bumps, more stop signs, and flashing light pedestrian crossing might be helpful. One of the teenaged Los Ryderz members was in fact hit walking across Wilmington and was definitely invested in the discussion. Another troubled spot that the group learned about was a school crossing point for often very young pedestrians and cyclists near 103rd and Wilmington. If there were a flashing light crossing, the bike group leaders and members agreed, then students would be much safer and likely to use their bikes as transportation. Finally, the group reconvened at the WLAC on 109th to make their way back to LA. It was also an opportunity to see the more than 15 bikes donated by USC’s Department of Public Safety (DPS) to ESR and Los Ryderz. Both groups agreed, the timing of the donation could not be better given the increase in interest amongst youth in the area combined with the holiday season.